My gorgeous niece, Rebecca, showed up with these fantastic little treats for the big Christmas Bash we had planned for weeks. 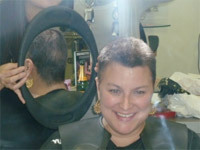 They were so fantastic I wanted to show everyone how awesome and easy they were and just in time for your big party!!!! 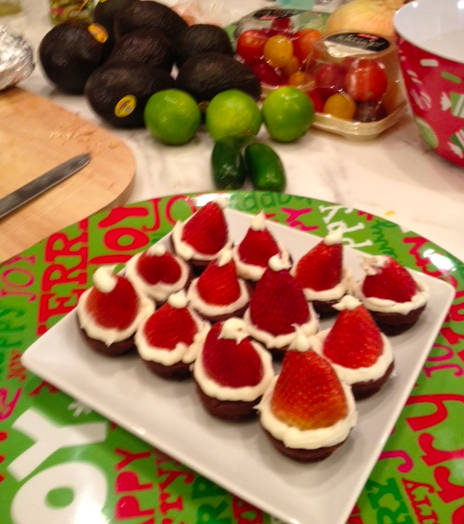 They are little brownie cupcakes creatively topped with strawberries and icing to look like little Santa Hats. What’s more to love – chocolate, strawberries and more sugar! Necessary equipment is miniature cupcake oven tray. Buy and make 1 box of Duncan Hines Brownie Mix, 1 carton of fresh strawberries (at least 12-15 pcs inside), and Duncan Hines Creamy Homestyle Buttercream icing. This entry was posted in ALL POSTS, Food For Thought and tagged Easy Brownies recipes, Easy Holiday Brownies, Santa treats brownie recipes. Bookmark the permalink. I am usually to running a blog and i actually recognize your content. The article has really peaks my interest. I’m going to bookmark your web site and hold checking for brand spanking new information.